TORONTO - The sweetest sound was the final buzzer. Canada built a four-goal lead on Russia and could taste gold at the world junior championship. What followed was a harrowing struggle just to hold on. "We didn't panic or certainly tried not to panic," Sam Reinhart said. There were moments of panic, but by the time Monday night was over, gold medals were hanging around the players' necks and they sang along with "O Canada" while locking arms on the blue-line on home ice at Air Canada Centre after a thrilling 5-4 victory over Russia. 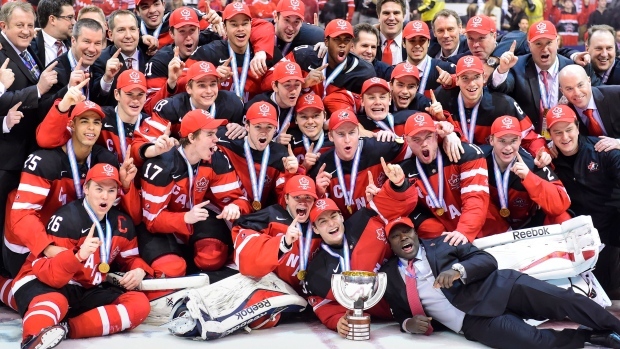 It wasn't easy, but Canada's world junior gold-medal drought that dated to 2009 was no more. "We're world junior champions, we're world champions. It's joy," Connor McDavid said. "We were never really under pressure. The media and all the fans might've been putting that pressure on us, but we were just able to brush it off. Right now this is just absolute joy." Joy was heightened by the emotional twists and turns of this gold-medal game, another classic in the passionate rivalry between Canada and Russia that began with the 1972 Summit Series. This will go down as another unforgettable piece of Canada-Russia history. "This was a once-in-a-lifetime opportunity and experience and we took advantage of it," Max Domi said. "It's awesome. No matter what happens in our lives, we're always going to remember this." Anthony Duclair scored to give Canada the lead and ignite the crowd of 19,004 just 23 seconds in, and Russian starting goaltender Igor Shestyorkin was chased after Nick Paul scored goal No. 2 less than three minutes in. Thanks to goals from McDavid, Domi and Reinhart, Canada proceeded to build a four-goal lead at 5-1, and this looked like it would follow the script of past games in this tournament. This veteran team led by 19-year-old captain Curtis Lazar, a rookie with the Ottawa Senators, had never trailed and cruised into the final. Goal by goal the lead got smaller, and at 5-4 coach Benoit Groulx was forced to use his timeout to settle a rattled team that looked like teenagers for the first time. "That's no question the most adversity we've faced throughout the tournament," Reinhart said. After going undefeated with victories over Slovakia (twice), Finland, Germany, the United States and Denmark, this was the first time Canada was really pushed. Clinging to a one-goal lead from late in the second period and through the third, the onus was on goaltender Zach Fucale, who imploded in the semfinals of this tournament a year ago. This time, Fucale was at his best, stopping all 11 shots he faced in the final period, including two in the final 12 seconds to preserve gold. "To come out in the third period there with all that pressure on his shoulders being the goalie ... he made some huge saves, calmed us down," defenceman Josh Morrissey said. "He was just able to calm us down and make some huge saves." The emotional ebb and flow of the building was palpable. Excitement built from the opening two goals and hit another high when Morrissey sprung McDavid for a breakaway goal that will go down as one of the signature moments of the game. When Reinhart deflected Domi's shot past Russian backup Ilya Sorokin to make it 5-1, fans — and likely players — could taste gold. What followed was a series of penalties and goals-against that made for a tense atmosphere. "I'm glad I was on the ice and not in the stands in the second period for a while there," Reinhart said. Groulx said it was clear the Russians were "here for a fight" and unwilling to wilt under pressure. Dmitri Yudin, Ivan Barbashev, Sergey Tolchinsky and Nikolai Goldobin scored goals to help make this one a classic. "The beauty of junior hockey," Lazar said. "Back and forth. You think you have it in the bag and they come back. that's what the Russians did. I thought our guys did a great job regrouping and staying calm." The poise of this gold-medal-winning team will be what Canadians remember. As dominant as this group was through the first six games, it had to bust out of its comfort zone to finish the job. "What a way to finish a game and win a gold medal," Groulx said. "We're very lucky to have these guys playing for us." The closeness of this group of 23 players aged 17 to 19 was never more evident than in the post-game ceremony when Lazar skated over to injured teammate Robby Fabbri and handed him the trophy. Fabbri was lost for the rest of the tournament with a high ankle sprain in the quarter-finals. "We all told each other and we locked our arms and we said we're doing this for Fabbs," Domi said. By the time it was over, this group made it clear they did this for the country, Hockey Canada, the fans but also for each other. That was part of the joy of victory. "At the end, I mean, it's a game," Lazar said. "It's a game we love, the fans love it, we love it, the refs love it, and we're all out here having fun."